What Does a Radio Plugger Do? Radio pluggers are a subset of public relations specialists who specialize in getting clients' music played on the radio, which now includes traditional radio, internet radio, and music streaming services. Pluggers are the link between bands, their labels, and station managers, show producers, and DJs. They're essentially being paid for the contacts they've built. The main job of a plugger is to get the acts they're representing exposure on radio or streaming services. When it comes to the internet there's a blurred line between press and radio plugging. The plugger should be aware of the differences between streaming, podcasts, and downloads. 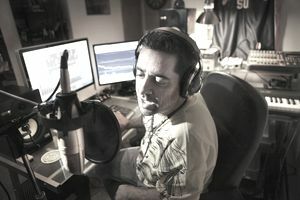 Some internet stations ask artists to waive their royalties to avoid paying a licensing fee, but many large labels won't allow this, nor will they allow their material to be used in podcasts or as downloads. Many smaller labels and acts are happy with the publicity that these avenues provide. The U.S. Bureau of Labor Statistics breaks down the salary range for public relations specialists, the broader category that includes radio pluggers. A plugger's salary can vary greatly depending on location, experience, number of clients, and whether they're working for themselves or an employer. It's usually up to a plugger to agree to a fee with the client. Some clients will pay based on results. The problem with this model is that a radio plugger can put in a lot of work, yet the track could get very little exposure. Conversely, a track may get a huge amount of exposure even though the plugger has done hardly anything. A good compromise is that the plugger gets a basic fee, with bonuses for achieving certain results. On top of any fee, the client will be expected to pay the costs of the campaign. Education: A degree isn't necessary to become a radio plugger, but many people in this position have at least a bachelor's degree in music industry management, communications, public relations, or business. Experience: Having a solid database of music industry contacts is one of the most important parts of being a successful plugger. That usually comes from exposure to the industry and experience. Plugging companies often take on interns, which is a good way to build up contacts and experience. To set yourself up as a plugger you'll need to build up your contacts list. There may be bands looking for pluggers, but be picky. Don't necessarily start working with the first band that approaches you, or the one that will pay the most. It's important to build your reputation as a plugger. A great way to do that is to work with acts you believe in. Interpersonal skills: Pluggers must interact with clients and the media regularly and be able to maintain positive relationships with both. Communication skills: Pluggers regularly represent their clients to music industry and radio station representatives and must be able to deliver concise, compelling pitches verbally and in writing to secure exposure. Resilience: Successful pluggers will be able to bounce back from rejection — which may happen frequently, especially at the beginning of a career. Knowledge of popular music: Keeping current with what's playing on the radio will help identify which songs could be hits with specific audiences and stations. The U.S. Department of Labor Statistics projects that employment in the general public relations field will grow 9 percent through 2026, which is slightly faster than the overall employment growth of 7 percent for all occupations in the country. Radio pluggers will spend time in an office making phone calls, sending emails, and meeting with clients. They may also travel to various radio stations and offices of other music services for business meetings. Pluggers usually have full-time positions if they work for a company, but for independent pluggers, hours can vary greatly depending on the number of clients.